I’m a bit peculiar about hydration when mountain biking. I typically use either my Osprey Raptor Hydration Pack or anything that fits in a bottle cage. While my primary water bottle is the Camelbak Podium Big Chill 25 oz Bottle I also often find myself frequently sticking a 24 ounce Poland Springs water bottle in the bottle cage. Years back the water bottles contained BPA and were much stronger and stiffer. Today modern BPA free water bottles are thin and extremely soft or pliable. Quite simply they frequently fall out of most mountain bike water bottle cages. This is not only bad because I risk being without hydration should I lose my bottle, it’s also bad because my bottle becomes litter in my favorite forests. Purchasing the Ibis Ripley presented me a new opportunity to research and test mountain bike water bottle cages. Despite wanting to default to an Ibera bottle cage my research concluded with the purchase of the Pro Bike Tool Matt Black Water Bottle Cage. First off I’m a curious guy and the bottle cage name “Matt Black” has me wondering if “Matt” is a typo for “Matte”. It would seem so as the other model is listed on Amazon and the Pro Bike Tool website as “Pro Bike Tool Water Bottle Cage Glossy“. I suspect Pro Bike Tool is an Asian company trying hard to sound American. Not that it matters. Immediately I became interested in the Pro Bike Tool Bottle Cage because an Amazon review points out that the bottle cage works well with Poland Springs water bottles as well as the Camelbak Podium Big Chill. Those two points sold me on this bottle cage. This cage being made from aluminum allows for slight bending of the metal to fit water bottles that may be less than ideal. The result? What’s not to love?I’m not much in to appearances but I don’t care for the way the water bottle cage looks. That said form must follow function and this bottle cage works great and I’m in agreement with other reviews. I am considering though, seeing if I can match the Ibis Ripley orange paint for the purpose of paining the cage to match my mountain bike and be less visible. Do you need a reliable bike water bottle cage, which also securely holds your water bottle and looks great? Whether you’re a Pro, Weekend Warrior or Cycling Commuter, we know you want and deserve the best. 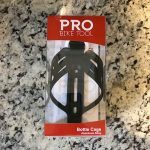 Buy the Pro Bike Tool Bottle Cage for PRO PERFORMANCE when it counts – the BEST Bottle Cage out in the market from the Bike Tool Experts. UPGRADE YOUR RIDE AND RIDE LONGER! Secure Bottle Retention System – Securely holds standard size water bottles: 2.875 inches / 7.3cm in diameter & indentation 5 inches from the bottom of the water bottle. Worry-Free Shopping with our LIFETIME GUARANTEE – We are very proud of the superior quality and high spec that Pro Bike Tool offers and are confident that you will enjoy it too. STAY HYDRATED ON YOUR RIDE – Quick & Easy access to your bike water bottle when you need it. Great for road, mountain, hybrid, touring & electric bicycles. Buy 2 bottle cages to stay hydrated for those extra long rides, so you can go the distance! SECURE AND STURDY BOTTLE RETENTION SYSTEM ensures a full bottle stays firmly in place when riding, whether you’re out riding fast on roads or bumpy trails. Fits most standard & over sized bike water bottles, including the following sizes: 20, 21, 25, 24, 25 & 33 oz / ounces (500, 550, 650, 750 & 950 ml sizes). One-piece flexible design, adjustable +/- 0.2 inches / 0.5cm to accommodate slightly smaller or larger sized bike water bottles such as insulated bottles. SUPERB DURABLE QUALITY & STUNNING FINISH – CNC machined aluminum alloy, heated treated for a strong & lightweight design. Powder coated matt finish, extremely easy to wipe off and clean. Lightweight at only 48g/1.69oz. QUICK & EASY TO INSTALL – Mount on your bike frame in under 60 seconds. Oval mounting holes allow for fine-tuning of position on frame. 2 stainless steel bolts included. Bike frame requires threaded holes for installation of bottle cage. PRO QUALITY – We’re so confident about the quality of our products that if you have any product issues, we’re very happy to either provide a Refund or a Replacement – can’t say fairer than that!